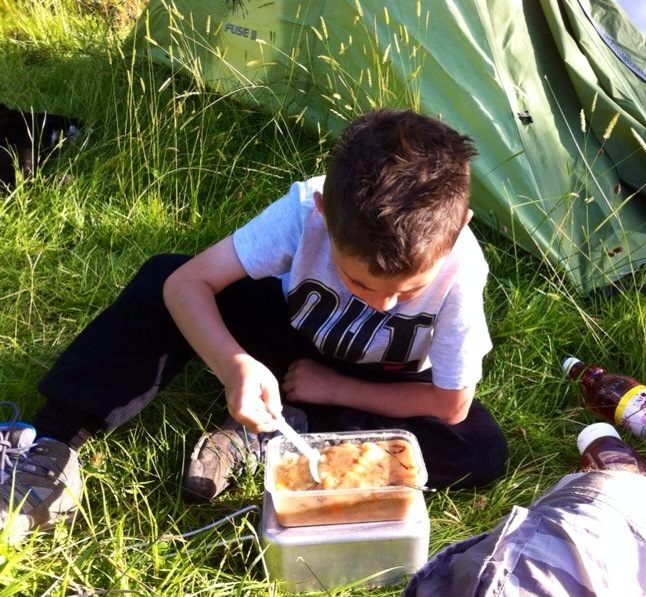 Recently my husband took our eldest son (and the dog) wild camping as part of the RSPB #BigWildSleepout. Our son was raising money for the charity and managed to raise £50.00 in total which he was really pleased with. £50.00 is a lot of money when you are six. What is the Big Wild Sleepout? The Big Wild Sleepout is part of the Wild Challenge, organised by the RSPB. Groups, families and individuals can work towards their bronze, silver or gold awards by exploring and supporting nature and the natural environment. Find out more here. Originally the plan was to sleep in a relative’s back garden but with so many woods and other suitable places for this type of occasion they decided to go ‘proper’ wild camping to a place not far from us called Deepley Vale. My husband has walked this area many, many times and knows it well. He camped here himself when he was younger and was confident that the area was safe. Of course, that didn’t stop me worrying all night but that’s what mums do, right? The boys arrived at around 5pm and set up camp. 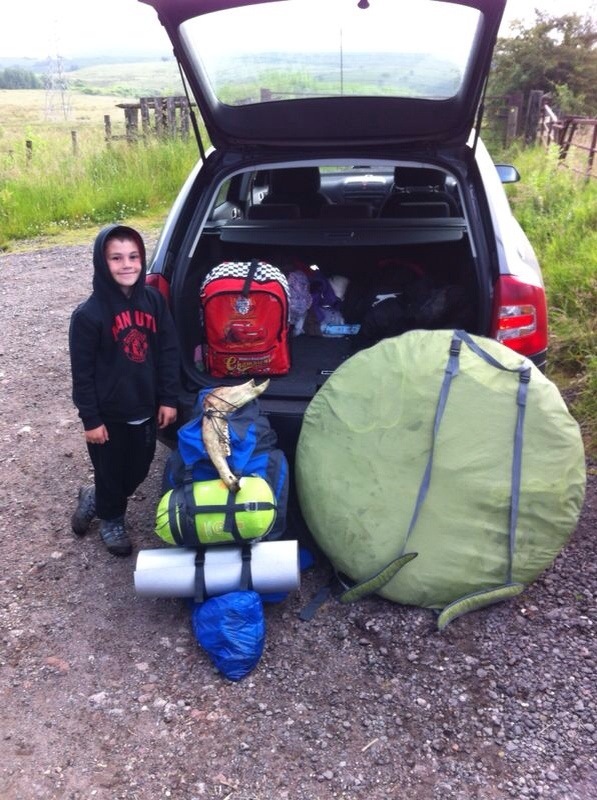 The boys travelled light, because there was only one trip to be made from the car to the area they were going to camp. The whole point of the Big Wild Sleepout is to get back to basics and appreciate your natural environment, so you don’t really need much equipment anyway. Once they were all pitched up, the boys tucked into the meal I had sent with them. I had insulated it to within an inch of it’s life so they could have a hot meal before bed. After food, the boys went to look for firewood and found rather more than they bargained for. 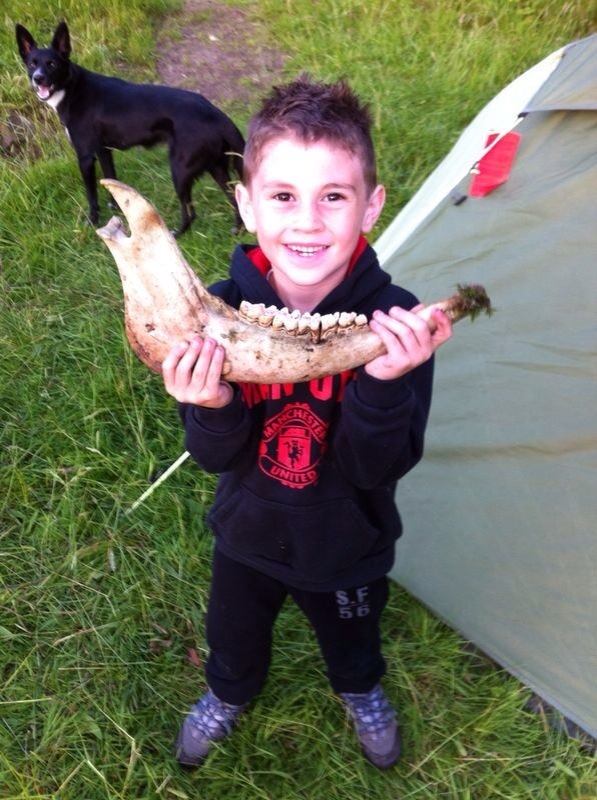 My son came home with part of a cow’s jawbone. Nice. It did make for a great learning opportunity though. The order of the evening though was to see what wildlife they could find. My husband has been interested in the natural world since he was a child and this passion has rubbed off onto our children. After some exploration, the boys found something wonderful! 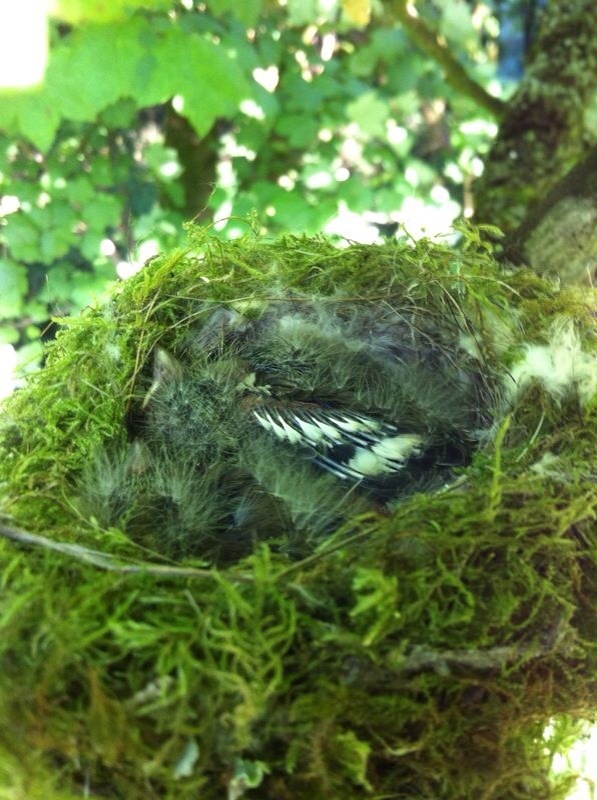 A nest of baby Pied Wagtails! Naturally, they took great care not to disturb the nest whilst snapping this lovely shot. It looks like a nest of fluff, doesn’t it. My son’s favourite creatures are bats. He loves them. 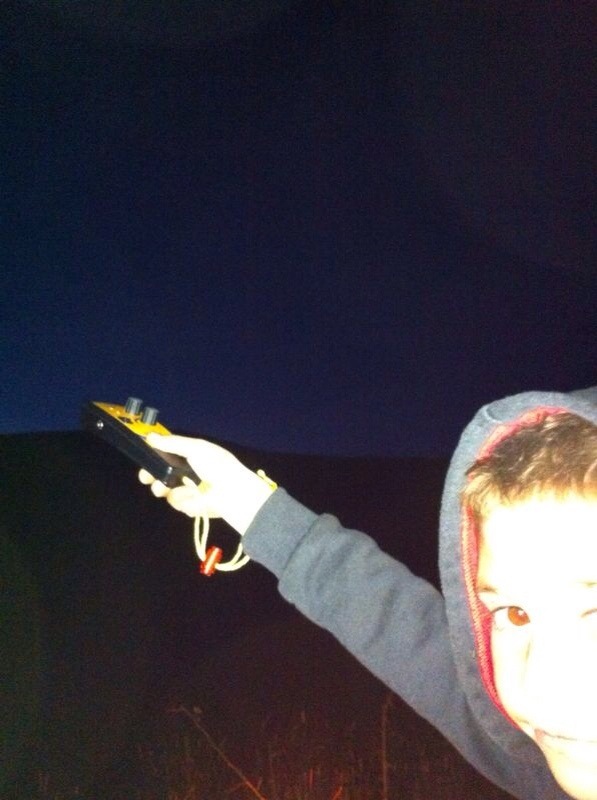 We pay each month to a bat charity to ‘sponsor’ a bat and often go on bat walks in the early evening with his’ bat detector, which we bought for his 5th birthday. I’m not sure I know any other four year olds that have a bat detector on their birthday wish list – and nothing else! So it goes without saying that the boys did a little bat detecting while they were out. This adventurous duo heard a couple of different bat species, which they think they identified as Pipistrelle (they weren’t sure which type) and Daubenton’s. After the excitement of the evening the boys settled down for a good nights sleep. They were disturbed once in the night by some animal movement but couldn’t see anything on further investigation. The following morning they were up, packed and home before I was out of bed! We were so pleased to have them back from their really wild adventure, and they couldn’t wait to tell us their tales! To find out more about the RSPB charity you can visit their website, and to take part in the Big Wild Sleepout yourself have a look at the dedicated page.